Three years ago, Gaijin Games developed a game that combined all the mechanics from arcade, platform and rhythm games, and the finished product was Bit.Trip Runner. It turned out to be one of the must fun, addictive and challenging titles available. Now, Gaijin Games have created a sequel. 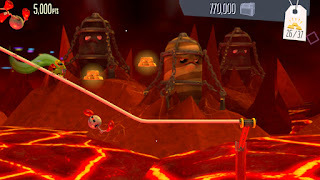 Runner 2, or Bit.Trip Presents Runner 2: Future Legend of Rhythm Alien, brings back the same gameplay with many new added features, and completely overhauls the graphics. To find out if it's as good as the first one, read our full review! The first major difference you'll notice between Runner 2 and the original is the graphic style has been completely changed. The first Bit.Trip Runner has wonderful old school pixel graphics, which really worked, but now they have been completely updated. 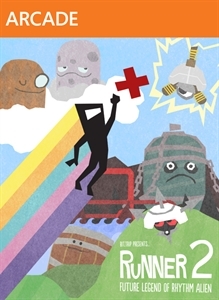 Runner 2 has polygonal graphics, with 3D characters, backgrounds and items. It looks absolutely gorgeous, and the worlds feel so much more alive. There is more background activity, more colourful landscapes and just cool things to look at. Each world is also really unique, with completely different colour schemes and general themes. You'll travel across beaches and through forests, and it really helps to keep you interested beyond the gameplay. Players of the original game will be able to pick up Runner 2 and instantly feel comfortable. The difficulty curve isn't too steep either, so new players will be able to get used to the mechanics before it starts to get too hard. 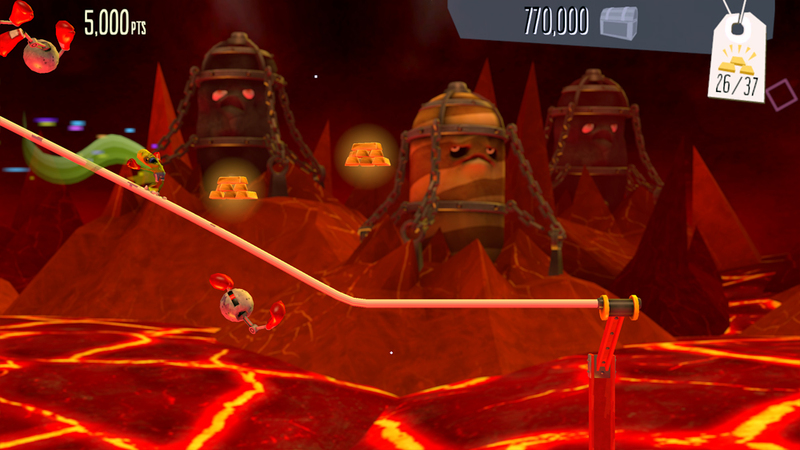 The goal of Runner 2 is to make it to the end of the level. Sounds pretty simple? Well, you don't control Commander Video's speed. He has a set running speed so you control his jumps, his slides, etc. So all you have to do is avoid the obstacles and if you can, collect all of the items. If you die, you start again. Fortunately, unlike the original, there is now a checkpoint system so all is not lost if you die past the halfway point. There is also no punishment for restarting at the checkpoint, you can still get a perfect score. 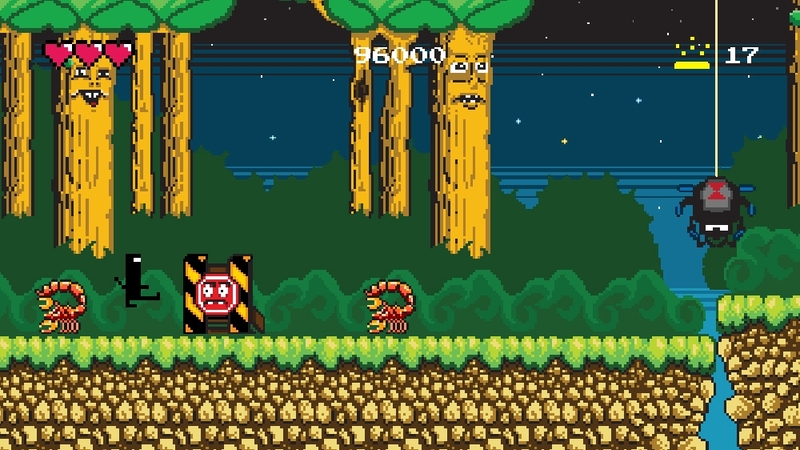 Hidden in many of the levels is a gold cartridge, which transports you to a retro themed level. They look and sound like the real deal, and it really does feel like you're playing Bit.Trip Runner: SNES Edition. The unique thing about the Bit.Trip games is that the music is created by your actions. 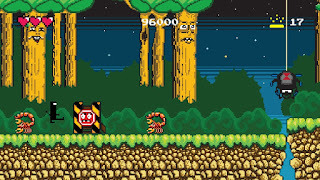 Each action has a specific sound, whether it's collecting coins, jumping over enemies or sliding under low walls. When you string all these together it creates a full music track. And it has to be said that, as with the original, Runner 2's soundtrack is incredible. The music is very ambient, and when you get to Extra mode, it's beautiful. It suits the game's style perfectly, and is easy to listen to outside of the game as well. If you manage to make it to the end of the level and collect every item, you will unlock a special extra section with a cannon from which you shoot Commander Video out of, and hitting Bullseye will give you a perfect score. All of Commander Video's techniques from the original game have returned. There are already quite a lot so it's awesome to see that Gaijin Games have somehow added a lot more. At some points, when learning new techniques, it seems like it may get overcomplicated but it really doesn't. You have the standard jump, slide, kick and block from BTR, but so many more are introduced, such as the slide jump and the slide kick, the loop-de-loop and the rails, which are similar to the rails in Sonic games. You can ride the top of the rails or hang from the bottom, and it's one of the best new features, especially when you start to get different rail paths and enemies all over the place. Runner 2 is probably the best sequel of 2013, and may not be beaten. There is something about it, and it's predecessor in fact, that fills you with sheer joy. It's hard to say exactly what it is. It's a combination of everything; the superb graphics, the loveable characters and beautiful worlds, the music that just floods you with happiness. If you were any happier, you would literally be crying with joy. I could play this game for days on end and not get bored. Bit.Trip Runner was incredible, yet Runner 2 completely improves literally everything. Gaijin Games are probably the most dedicated developers out there. They want to make a game that people will love as much as they do, and they have definitely succeeded. Go buy Runner 2.